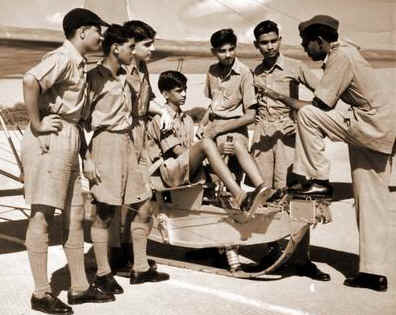 In 1960, the School formed No 6 Wing of Shaheen Air Training Corps (SATC) at PAF Base, Sargodha to train the students in gliding. Principal PAF Public School Sargodha Mr Hugh Catchpole was appointed the first Officer Commanding (OC) of the Wing. The glider instructors appointed were Flt Lt M I Beg and Flt Sgt Zahoor. 04 gliders were received from PAF Academy, Risalpur. Former Chairman Joint Chiefs of Staff Committeee (CJSC) General Ehsan-ul-Haq always wore the "Glider Badge " on his uniform which he earned at PAF Public School, Sargodha. On 19 September, 2007 he paid his last official visit to the institution as CJSC. In his lively, informal chat with the young Sargodhians he said: "It took lots of gut to fly those gliders." 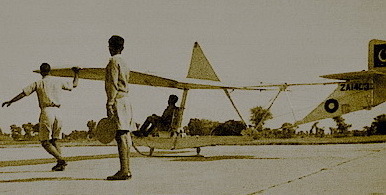 In fact the gliders used in sixtees were essentially human-powered aircraft (HAC). The crew comprised of three: One pilot; who would sit with joystick held with both hands and feet set on pedals; and two assistants; who would push the glider to add thrust while the pilot propelled with his legs. Those gliders never took off under the pilot's pedal-power alone. An additional thrust by the assisting crew was always required. After the glider had lost touch with the ground the assistants would drop behind. However, the pilot would continue propelling with his legs while pulling on the wings to attain a reasonable height and experience lift from thermals, the rising air currents. The pilot had to do it fast enough to fly. It was as tough as riding a bicycle up a steep hill. Many would land physically exhausted.Those fully human-powered flights were indeed a test of pilot's strength and stamina. Besides it required a good knowledge of aerodynamics to control the aircraft. 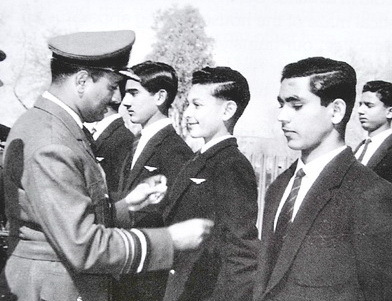 The first batch of students successfully completing Glider Training was awarded Glider Badges by the C-in-C PAF Air Mrshal Asghar Khan on the Founder's day held on 18 December, 1960.